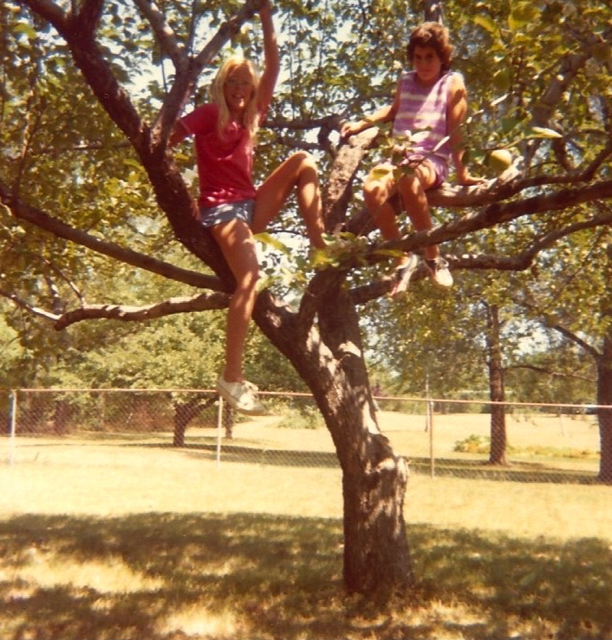 Climbing trees in the 70’s in Orchard Lake, Michigan. That is how a local orchard owner described the aroma and fermentation of making old-fashioned apple cider. I know exactly what she means. As a young girl, I used to climb the trees in my grandmother’s apple orchard. I know that familiar smell of wet leaves, fallen apples, and the crisp earthy air. Last weekend for a lark, I went a-wassailing at a local cider maker, to learn more about growing apples, sample some cider, and for the simple pleasure of being outdoors in a fruit orchard on a sunny January day. Wassailing is a medieval custom to annually bless and drink to the orchard in winter, to encourage a good harvest in the coming season. This ritual might come in handy. I now live in a hundred year old house in Victoria, Canada and have inherited a small orchard of two trees. The largest one is old and lovely and crooked and covered in moss, and propped up with a 4×4 board, but still produces a good late summer crop of soft, sweet apples. My urban farming neighbour says these are Gravenstein apples. I’ll take her word for it. 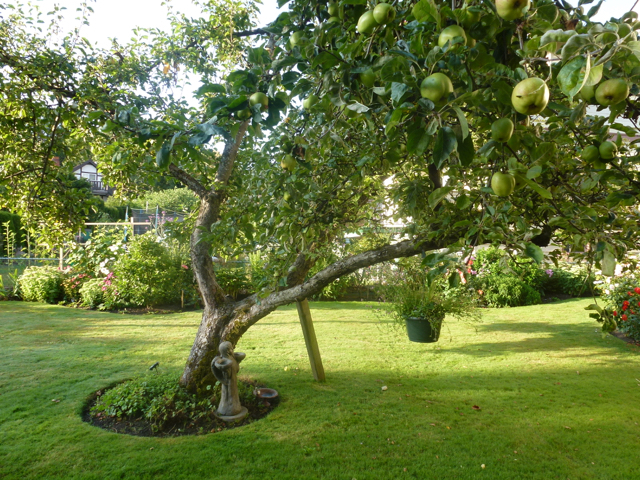 The focal point of the backyard … a lovely heritage apple tree. And I love this old tree. La Vielle Arbre des Pommes. I was married under this tree. In summer I sway in my grandmother’s hammock under this tree. My pup likes to lay at the base (her “post”) and survey the yard. The woodpeckers, chickadees, hummingbirds, juncos, sparrows, robins and flickers all enjoy this tree, too. 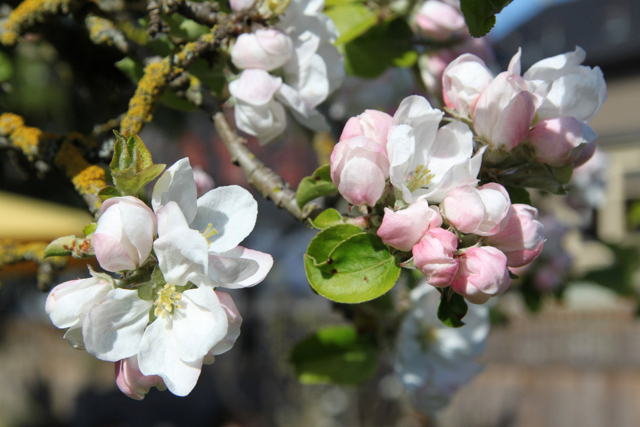 The old apple tree blossoms around May 1. 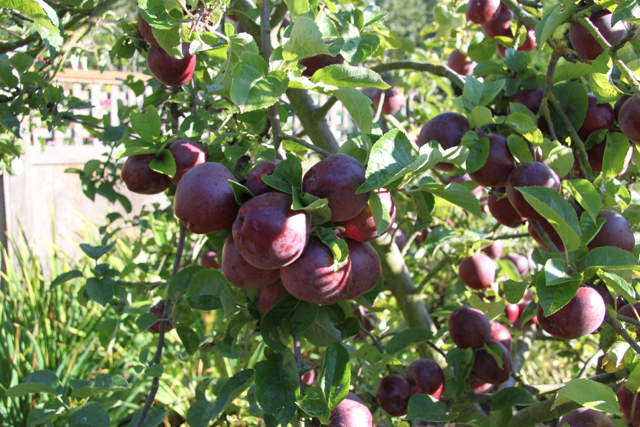 The smaller tree produces apples that are typically ready in late September-early October. I also have a pear tree, but that is another gardening story for another time. For now, it is still winter and the trees are bare. Yesterday it was calm and sunny, so we gave them a light pruning, and sprayed them with dormant oil. It will still be a few months until they blossom; still a few more before their fruit slowly ripens over summer. In the meantime, there is nothing more to do except continue to love them, admire them, and wait for the bountiful harvest. Cheers. Helen, I’m in Canada! Is this custom alive and well in England? Sorry, should have read more of your blog/read more careful…. Anyway, yes the wassailing tradition is alive and well, though not that widespread as far as I am aware. Hope you can see the wassail here some day!